We will visit you on location, help you choose trees, visually assess their health, compare your goals and objectives with the trees that we find, looking for the best possible match. We will take measurements and make some basic concept sketches. Depending on the type of visit, there may also be time to research locally available materials and/or budget for the project. The fees for a site visit in the contiguous United States range from $400 to $5500 depending on the length of the visit and the cost of travel. The closer to West Chester, PA, you are, the less it will cost. Our founder, Dan Wright, is an ISA Certified Arborist and has a keen eye for tree health and environment. However, we welcome the inclusion of other arborists, some who have higher designations or have more local knowledge of trees in your area. Who we recommend involving will vary based on location, tree species, and project specific factors. Local arborist evaluations cost between $100 and $300. Consulting arborists will often charge higher rates. If remedial actions are recommended, they will be quoted separately after inspection. These can be completed by hand or on Sketchup or similar software. The goal is to help you visualize what the treehouse will look like when it is complete. This is a good step to take if the project must be submitted to a board or to a homeowner’s association for approval of the project, or if you need something to help generate buzz or raise funds for the treehouse. The cost varies typically from $200 – 800, depending on how detailed you want the finished product to be. 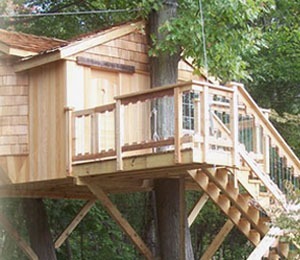 These are completed in auto cad and are best suited to helping you build your own treehouse. They may also be helpful for applying for permits when no engineer’s stamp is required. The cost varies typically from $500 – $2,000, depending on how detailed you want the finished product to be. Looking for a bargain on basic treehouse plans? Our sister company, TreehouseSupplies.com, has some basic standard plans starting at $49.99. There are a few engineers who have devoted significant time and energy to designing serious treehouses nation wide. While getting an engineering stamp for a basic treehouse is not always necessary, it is almost always necessary if the use is commercial or if you are running utilities to the site. The engineer typically does not visit the site – they work from our measurements, photos, and video. This step will require some up front expense and time. Like anything else, it we ask them to rush, it will cost more. When to Choose the Complete Tree House Process? If you are planning to build a tree house with any commercial use such as a public park or an arboretum. If you are planning a tree house bed & breakfast or an adult tree house that is more like an extension to your home than a kids treehouse or play structure. If you are going to seek a building permit for the tree house. Some building departments may require this level of planning and design service be completed and submitted to the township with the permit application. If you are going to hire another builder to perform the tree house construction. Some builders may request that complete plans be made. If the expected cost of the treehouse is significant. In light of your total investment, it may make more sense to perfect the tree house planning and design work at the outset. If you need to see an architectural rendering of the tree house design in order to visualize the proposal and decide whether or not to proceed with the tree house construction. If you generally prefer the highest quality and most thorough services possible, regardless of cost. Basic Tree House Design Process: If this page sounded like overkill, then consider a more expedited and less expensive way to get a treehouse. Learn how to build a treehouse from us at one of our upcoming workshops! This is the best way to learn the principles of treehouse construction and then design your own treehouses. Also, consider sending your preferred local builder to our workshop either with you or on his own. If you looking for as much free advice as possible (don’t feel bad, you’re not alone here) then you may learn more about tree house design here (the treehouseguide.com). Good Luck!